I've recently reinstalled my SONY VAIO laptop (VGN-SZ71E/B) with Windows 7 (with dual boot with Ubuntu 9.10, see this howto from lifehacker). 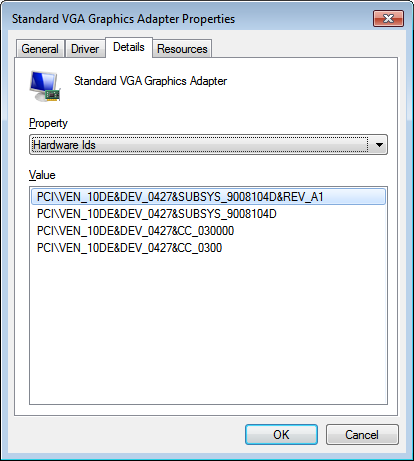 "nVidia setup program could not locate any drivers that are compatible with your current hardware. Setup will now exit." So I tried the driver finder from nvdia download page, which one told me that the manufacturer (i.e. SONY) requires that the driver should be downloaded from their website. They only propose the original driver which is as old as prehistory (November 2007) and 32bit while my windows 7 is 64bit. After a google search, I've found laptopvideo2go website which provide a decently recent drivers (v190, July of 2009, while the last from nvidia is v195) and a modified INF file that allow the driver to install on your laptop. They ask for an Hardware Id to allow you to download the correct driver. then click the "device manager" link in the upper left corner of the window. on the next page, click "Click here to download driver and INF files." link. "Click here to download the requested driver." "Click here to download the modified INF file." The first will give you a 7Zip auto extractible archive and the second link will give you the modified nv_disp.inf file. Double click the exe file to extract it somewhere, replace the nv_disp.inf file from the extracted drivers, run the setup, reboot and It's done, a recent nvidia driver on your laptop. Thanks to www.laptopvideo2go.com for their work !